The Hillerich & Bradsby Company is as traditional as they come. Responsible for both The Louisville Slugger baseball bat and PowerBilt golf clubs, H&B is one of the biggest sports names you've never heard of. Since 1916, PowerBilt clubs have been played by the winners of over 100 professional golf tournaments. Today, thanks to the company's decision to discontinue professional endorsements and pass the savings on to the consumer, PowerBilt clubs fill an important niche between flimsy discount-store clubs and often grossly over-priced high-end equipment. With the recent introduction of its Citation Beta Ti Driver, PowerBilt has proven once again that it is possible to build a solid, reasonably priced titanium driver. The Beta Ti, with its jet-black paint job, brass back plate, and signature equestrian details (the initials HB in a horseshoe and the name itself, Citation, after one of the greatest race horses in history), hearken back to PowerBilt's storied past. 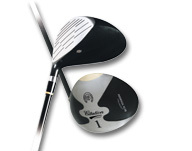 The clubhead is 330cc and weighs 197 grams (+/- 3), so it is fairly large. In fact, the face is so deep that you may find it difficult to tee the ball up high enough to make contact with it in the middle of the forged beta-titanium club face. It can also be fitted with five different shafts. We passed the Citation Beta Ti around to six golfers, ranging in skill from scratch through high-handicappers. The consensus was that the club's large head makes it ideally suited for slower swing speeds - those players who generally hit it straight, but without much power. The extremely deep beta-titanium face will definitely add distance for these golfers, even on off-center hits. Other oft-heard comments were regarding the difficulty that same deep face imposed on teeing the ball: I recommend those 3-inch tees to guard against hitting it thin. Also, it is a myth that a large clubhead will help cure a slice. In fact, larger clubheads take more time (or faster hand action) to get the face square at impact. Our scratch golfer, who was working on correcting an over-zealous draw on the range, promptly hit three wicked slices with the Citation. Definitely not something he usually has trouble with. However, when both he and two of our three mid-handicappers teed the ball up higher and placed the ball opposite or slightly IN FRONT OF their left toe, their hands closed, the face squared, the slices disappeared, and the balls sailed on average about 10 yards further than with their current drivers. The key was getting the hands squared, hitting the ball on the upswing, and "chasing" the ball down the target line with the hands (so as not to hit it thin). According to Joe Libby, Head Pro at Thunder Bay Golf Resort in Hillman, Michigan, PowerBilt clubs are extremely popular with his customers. "A good pro-shop needs a range of equipment," explains Libby. "We sell some of what I call the Lexus golf clubs. But we sell a whole lot more of the Buicks, like PowerBilt. They get you from A to B just as fast as the Lexus, but at a lot lower price." Libby speaks the truth: At just $220 suggested retail, the Citation Beta Ti is easily one of the least expensive titanium drivers on the market. The Citation can be placed head to head against any of the high-end, deep-faced Ti competition, and any discernable difference in performance-if there is any - won't be worth the extra $150-400 difference in price. The first wood I ever owned was a PowerBilt 4-wood given to me by my late grandfather. It was wood, had a jet-black finish, and a clear, circular synthetic-polymer insert in the face, through which you could see a drawing of a horse's head. It was simply the coolest, classiest club I had ever seen. When Fuzzy Zoeller won the Master's with PowerBilt clubs in 1979, that 4-wood looked even cooler. Today, the Citation looks every bit as cool, with the added punch of titanium. And it's still inexpensive enough for an old duffer to buy for his grandson. 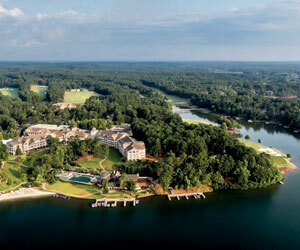 Let The Ritz-Carlton Reynolds, Lake Oconee create unforgettable Georgia vacations with packages that deliver adventure-filled weekend getaways, unrivaled golf outings or romantic escapes with your significant other.